What a great few days we’ve had camping at Craigleith Provincial Park. The park is located right on the shores of Georgian Bay in Craigleith Ontario. The weather was amazing and we got to kayak a bunch of times. 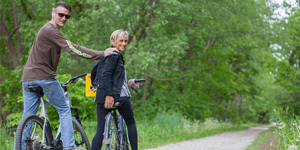 Craigleith is located in between the town of Collingwood and Thornbury. Each time we go up there we realize that’s where we’d like to be full time if we could find a way. Our last full day was spent visiting some local craft breweries with Philip’s brother Paul, his family and a good friend. 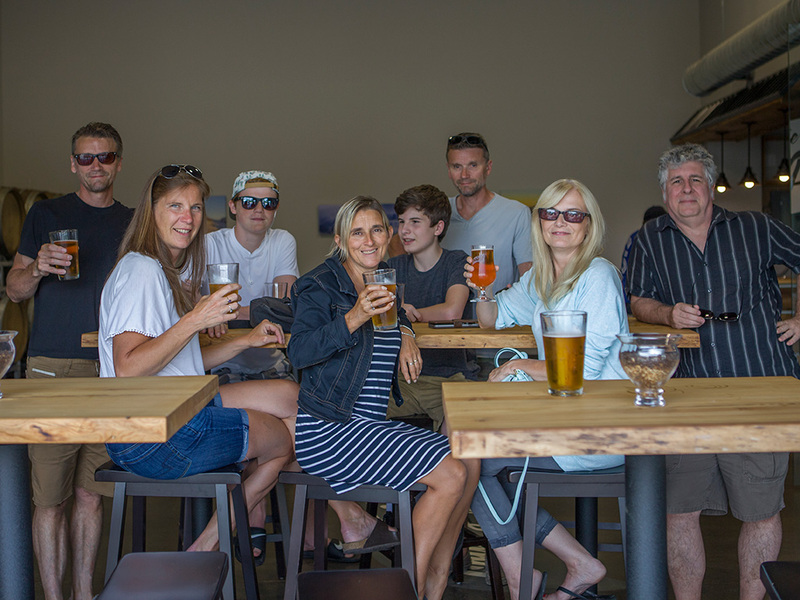 We visited Collingwood brewery first and met a very nice lady who showed us around. She also owned a farm and raised her own animals so it made the trip more interesting. Next we went to Sidelaunch brewery, both were great local small craft breweries. After a long day out site seeing we had a nice relaxing hot tub and BBQ. 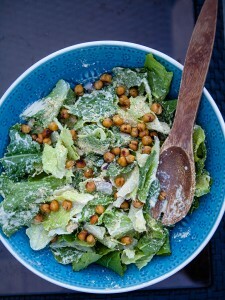 I decided to make this great simple vegan caesar salad. 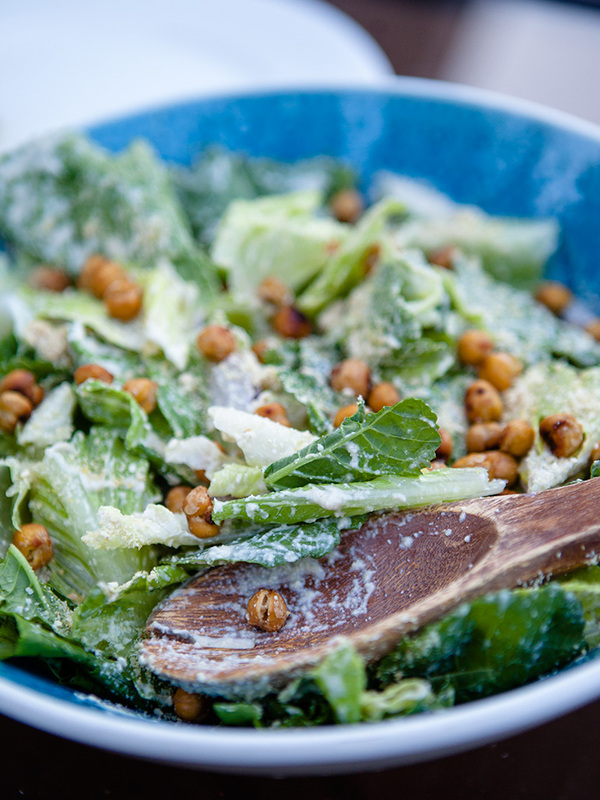 The base of the dressing is cashew nuts to give it that creamy texture that caesar salad has. Instead of using croutons I roasted chickpeas! The dressing does take a while to make since you have to leave the cashew nuts soaking over night. You could soak them for at least 5 hours to get the same creaminess. 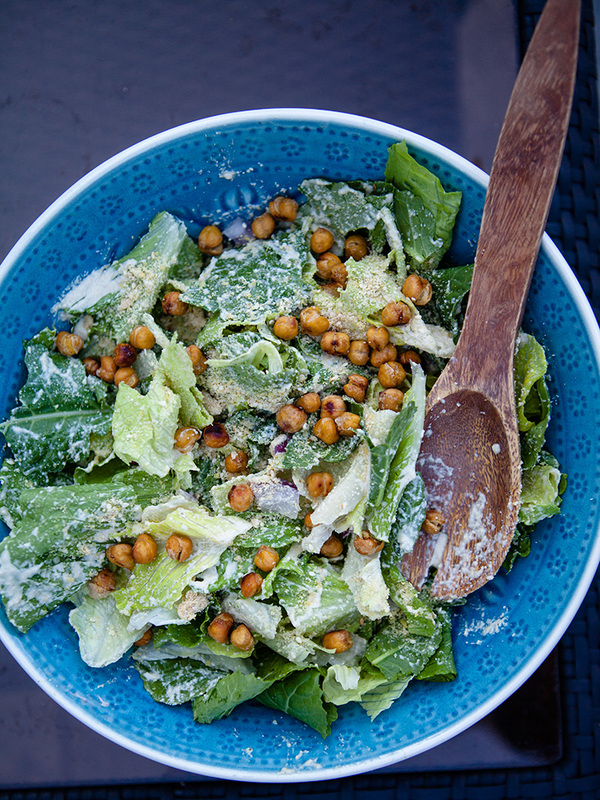 Chop romaine lettuce and mix with kale in a large bowl. Prepare the dressing. Drain the cashews. Add the cashews and all other dressing ingredients (except salt and pepper) into a high speed blender, and blend on high until the dressing is super smooth.. Add salt and pepper to taste . Set aside. Prepare the parmesan cheese. Throw all ingredients into a blender. Process for 30-60 seconds. Enjoy your vegan parmesan cheese! Roast chickpea croutons: Preheat oven to 400F. If using canned chickpeas place chickpeas in a tea towel and rub dry. Place oil, garlic powder and salt in a bowl. Toss chickpeas in mixture, Place onto large rimmed baking sheet. Roast for 15 minutes at 400F, then gently roll the chickpeas around in the baking sheet, then roast for another 10-15 minutes, until lightly golden. They will firm up as they cool. Pour dressing over kale and romaine. Toss together. 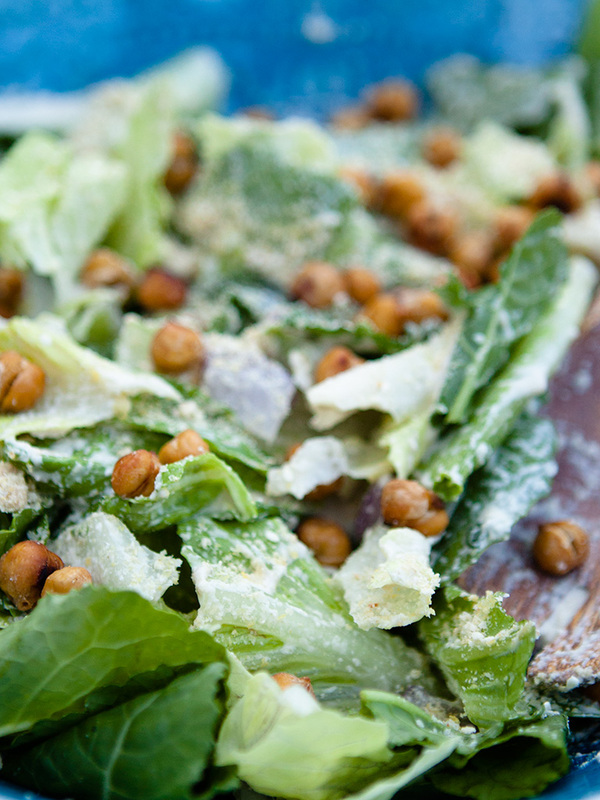 Top with toasted chickpeas.